She struggled with all her might but could not free herself as many men were pushing her down. She was also crying for the help but no spectator came to help her. Then the man came with the knife and slit her throat. Her last wish was that someday people stop eating meat so that goats can live longer. P.S. - Was going for Fiction 55 but went beyond by four words. Any way I just hope that you like this attempt of mine better than my last 55er. Thanks Vibhuti not one entry I have completed two entries thinking for more. you know quality is more important than quantity. wouldn't you agree? thanks very much chandni for the comment. try to vote for me. Sensitive write up.. but when human beings are ready to 'eat' human beings, who cares for goats now a days? But that does not reduce value of what you are saying. 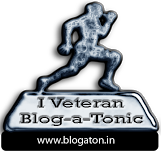 Interesting post... the first of its kind I have seen in blogsphere. though i am a meat eater but seriously i am not in for cruelty against animals..
Keep it up!!! Loved it!! Easy to read and conveyed a lot!! Thanks Azad it really means a lot to get such lovely comments. Nice laconic story of 59 words and yet enough to convey the message powerfully. Love it !! Thank you very much Binzy for your kind words of appreciation. Really a wish that has to be granted for sure. Hey, very well written! Even though u went over the word limit it was well expressed. that's what someone told me how a 55er should be glad that you like it. now i wish that someone vote for me as well. Thank you very much Amity for liking the story. I just hope that someone cast first vote for me this BAT. Thanks Guddu for liking the story now I only hope that you liked it enough to vote for me. nothing like that just people in India mostly eat them for meat that's why. Wow didn't know one story would do that Yahoo I have 5 followers now. Thanks man for liking the story. you guys are what give me reason to write more and write better. Reminds me of a post which I wanted to write on the same lines! all the best yaar...its realy very good..!! Thank you very much Mayur. thanks Vitthal that was my only 2nd 55er which I couldn't match anyhow due to topic constraint. but thanks for the comments. Rocking story-starts off by creating a very different picture and ends up with a altogether different twist. And the fact that you have done with such brevity and flourish is what makes it amazing ! There is a picture I saw in the news (I wish I had the link to it) which would be so perfect with this post. I'll try and summarize it in words; there is a shop and to the right of the entrance to the shop there is a child sitting and playing with a goat. The profoundity comes in when you realize that its a butchers shop....I'm sure you can imagine the thoughts that ensue. Yes Sidra .. Thanks for the comment.